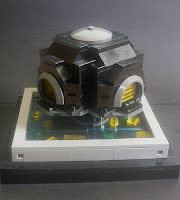 As I mentioned in this post I intended on building a frame with parts from the Dalek "minifig" from Character Builder. I used the base as part of the torso and the head as a sensor dome. Right now it has (2Y/Gd8/2W) for systems. I may add for the giant hands. 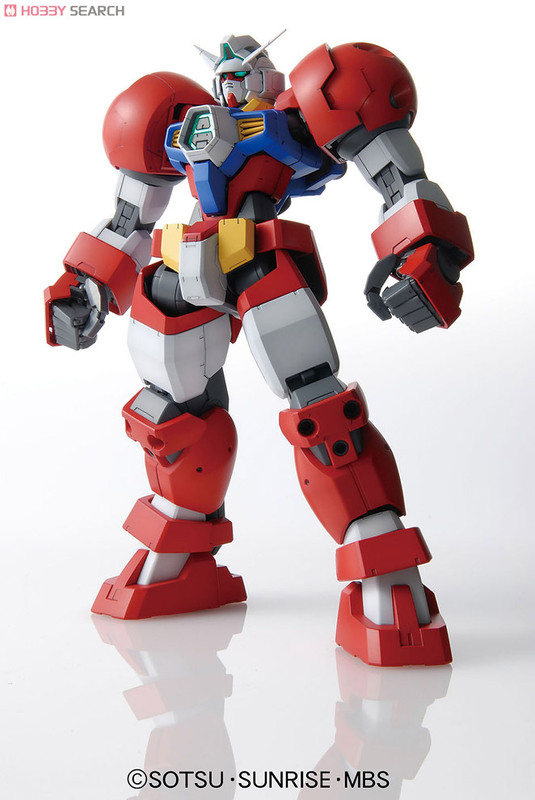 I've used model kits of giant robots as a source of inspiration for a while. They provide a three dimensional look at a normally two dimensional object. 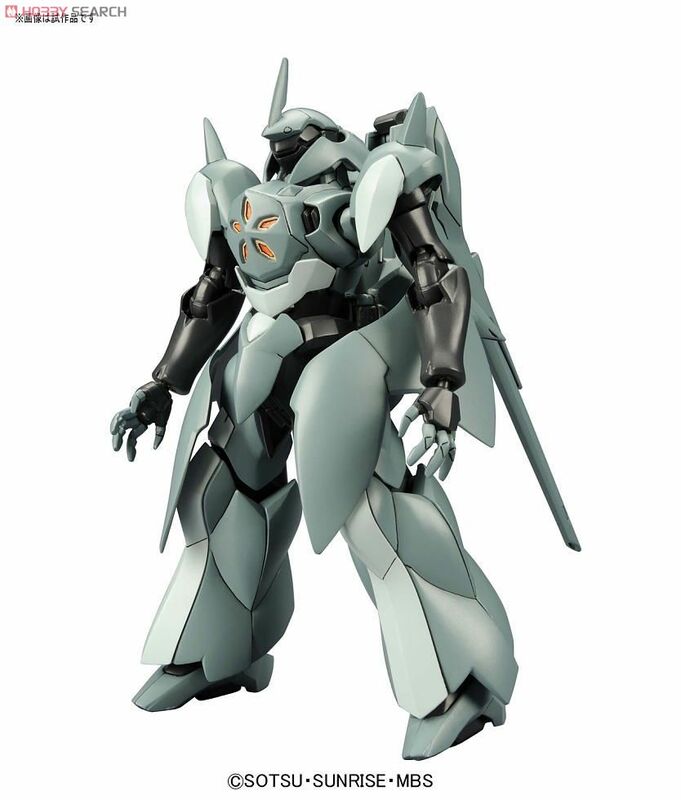 Here are a bunch of links to model kits I've found interesting. 60017 Flatbed Truck, $19.99 for 212 pieces. Maroon and orange pieces, and considering how poorly priced the latest crop of City sets are, this is a godsend. 10662 Lego Creative Bucket, $29.99 for 606 pieces. A nice range of colors with a decent amount of SNOT and Technic bricks. 10657 My First Lego Set, $14.99 for 148 pieces. For a "first" set there are a fair amount of the fiddly bits that we love in here. You can even build on the box lid! 700000 Razcal's Glider, $11.99 for 109 pieces. 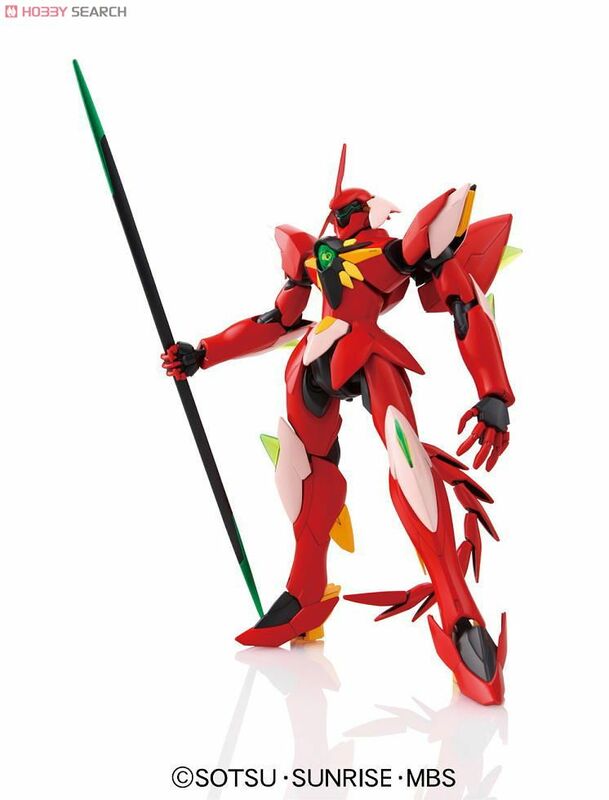 The price point might be a little off -- $0.11-- but there are a ton of little fiddly bits, and a new piece, that are great for building mechs with. If you can grab it on sale, do. 21013 Big Ben, $29.99 for 346 pieces. 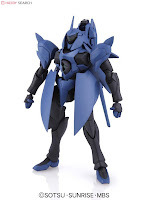 Here's a first, an Architecture set being recommended for parts. The secret? It has nine Travis bricks, three 1x1 w/2 Stud bricks, five "new headlight" bricks, and a ton of tan plates and bricks. 76004 Spider-Man: Spider-Cycle Chase, $19.99 for 237 pieces. Two new Technic pieces, Cheese Slopes, Travis bricks, some nice green pieces, some tan, and a PpP of $0.08 for a licensed set? Deal! 60018 Cement Mixer, $19.99 for 221 pieces. A large amount of hinges, clip plates, plates w/handles, brackets, and other fun bits make this another good city set. 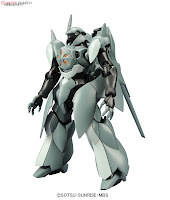 70003 Eris' Eagle Interceptor, $34.99 for 348 pieces. Right on the $0.10 Price per piece sweet spot, this one is a little larger than I generally recommend. There are a lot of great parts in neat colors, and it looks like a ship from the old Buck Rogers tv show. Sold! Last week I was on a bit of a building spree. Foreground: Olive Green Crab Mecha. Mid-Ground: Steiner/Herrick Model 1 "Smash-Hands". Most of the parts from these come from two 70001 Crawley's Claw Ripper sets. I wasn't planning on doing a blog post today. 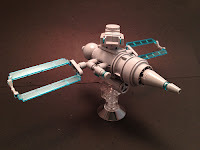 But I read a really interesting article on Brickset that I just had to share. 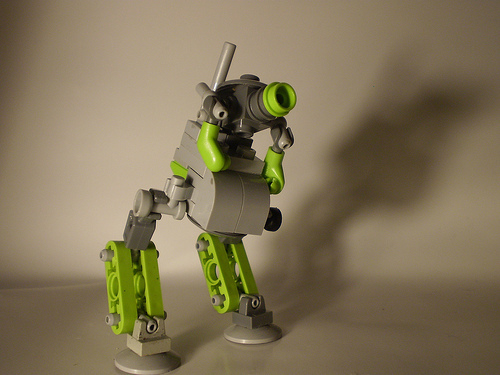 Michael Bradford has done some stunning work researching the PpP of Lego Pick-A-Brick cups. Here's his 10 page paper showing his results. I'm going to have to look into this "K2 box" he mentions. I stumbled across this site because he visited my Flickr stream. 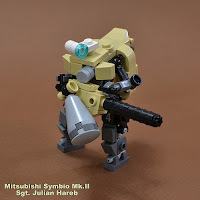 LegoRobo.com Whomever is writing it, he don't seem to build anything in the scale MFZ normally uses but, he has posted a bunch of what look to be instructions. And he makes mecha. That's all we need to know. It is written in Japanese so use a browser that has a translation feature. There are a string of blogs that have the base idea of presenting images of a central concept. These sights can be excellent sources of inspiration. Concept: Guns This one's still in the beta phase. Concept: Aliens This one might not be as much use but, I'm including it for the sake of completeness. Take a look. See if anything catches your eye. Seeing as we have such a vibrant community, it's a bit of a shame that the wiki is bit of a wasteland. Maybe the more active members of the community can take "ownership" of different sections and make them more active and interesting. I'm willing to update the Community section. Between myself, Malcolm, Zeekhotep, and the other bloggers, we should have more than enough informative things to add to the wiki that people should find interesting. 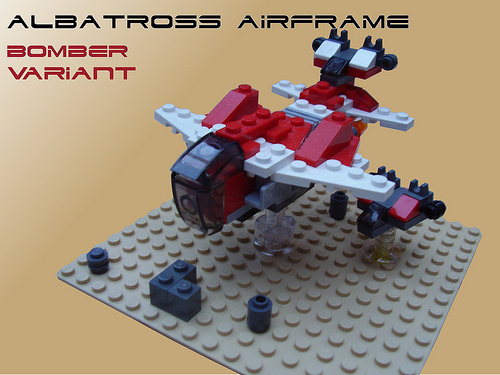 The Mobile Frame Hangar will be open for registration from 12 noon to 5pm Eastern Time on Friday (4/12/13). Notification e-mails are still not working so please inform me here or on one of the other sites -- Facebook, Flickr, G+, etc. -- what username you registered under and I'll activate it manually. Some random neat looking things I've found in a recent troll through the Flickr Lego group. 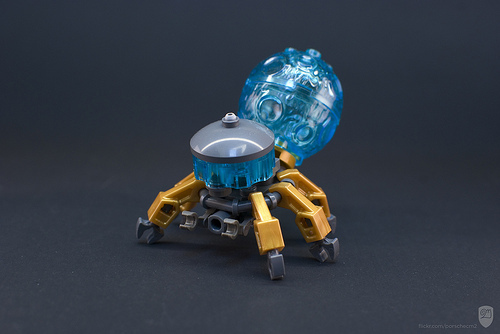 Mini Marchikoma 2 by porschecm2. Albatross Airframe - Bomber by Harding Co.
Mitsubishi Robotics Symbio Mk.II by .Tromas. Meanwhile at the Legion of Doom by [skatersponge]. Home Sweet Home! by A Plastic Infinity. 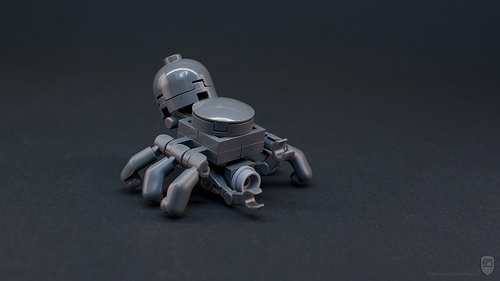 Mini Marchikoma 3 by porschecm2. I can see you thinking "Minifigs? 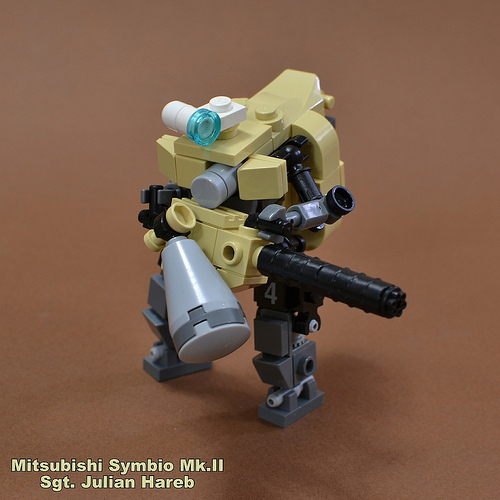 We don't use minifigs in MFZ." Ah, but we do -- if we break them down for component parts. And, since the item I'm reviewing is the Dalek minifigure, I think it's something we could use. Here's the Character Builder Dalek and the package it came in. As you can see the Dalek breaks down into five pieces. The eyestalk and the weapons are removable. They also really need to be seated firmly so they don't fall out. The two pieces that catch my eye are the head and the base. The head could be used as a sensor dome and the base could be used as a shield. The "neck" section could possibly be used as filler but I'm not sure. Here are the old and new models together. The newer model Dalek was in Series 2. The differences between the two are obvious. You can see the newer version of the Dalek breaks down into more pieces. I prefer the head from this version. It's a little bigger and can actually take a Technic Friction Pin. The weapons section could prove useful as a weapons pod for a Frame. I think there may potentially be more usable parts in this version. I'm really going to have to track down more of them as this one belongs to my girlfriend. Overall, I'd give these a B+ grade. They have useful and interesting parts, but also parts that may not be useful. In a comment on my last Instructions post, Wordman clued me in to a bunch of instructions that he had created. +Alastair McGowan on the G+ page asked if anyone had a good source of instructions for Frames. So I figured I'd try and compile one. There are, of course, several sets of instructions in the rulebook. There are even more on Flickr. Grunt Mk.3 instructions by Pasukaru76.